Protein-packed and fiber-filled, this salad is not only completely satisfying but tasty as all get out. As it keeps well, this salad is fabulous for a picnic or packed lunch. 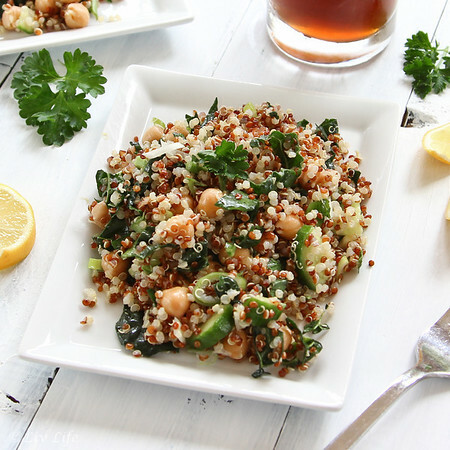 Mix the ingredients in measurements to suit your taste... this salad could just easily be a Kale Salad with Quinoa and Chickpeas as it could be the reverse! 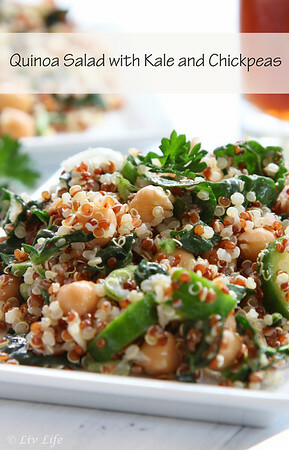 Place quinoa, kale and chickpeas into a medium bowl and stir to combine. Squeeze the lime over the mixture then drizzle the oil. Toss to combine. Plate, then salt and pepper to taste. Cover and chill any remaining salad. Keeps very well for the next day... simply toss and refresh with an additional squeeze of lemon and a little drizzle of oil if desired. Enjoy! Love this healthy salad - kale can be tough - I prefer either massaging the kale a bit with lemon juice and olive oil first (the longer you massage it the softer and silkier it gets), or using baby kale varieties which are really tender. Thanks Jeanette! I've seen some of your recipes with the massaging. It's on my list to try! Oh Kim, this looks just wonderful and I don't think kale will ever go out of season. Now this is my kind of salad!! That looks amazing!